Hayley flew in on a gross, snowy day-and thusly had some flight delays. She did eventually arrive, just before 8 PM, and we wasted no time heading over to my favorite Astoria bakery (a 15 minute walk from my house), Martha's Country Bakery. I absolutely love the cannoli there, so Hayley and I both ordered one of those. Then I also got a chocolate croissant, Hayley got their "NY Cheesecake", and Michael got some sort of mochachino sort of thing. Hayley said the cheesecake was the best she'd ever had and, just like everyone else, she fell in love with the adorable little bakery full of an endless array of goodies! Hayley had never had a macaron, and everyone told her she had to try one while she was here. I did some research and Bouchon seemed highly recommended-plus it is right in Rockefeller Center, where we spent the first half of our day on Saturday! The bakery had a gorgeous assortment of pastries and sweets, but we had to stay focused on the colorful macarons. After some recommendations from the super sweet girls behind the counter, I settled on a vanilla mini macaron and Hayley got a pistachio mini macaron. Our macarons and Hayley instagramming :P.
I'm not generally in love with macarons, but I really liked the vanilla-it had a great, delicate flavor and the crisp yet chewy texture was perfect. Hayley and I agreed that macarons aren't our favorite sweet, but we definitely liked them and we were glad that we tried these. Hayley and I did some fun Rockefeller Center exploring and shopping, and we went to the Top of the Rock-which has the most stunning view of the city. Afterward we were absolutely starving so we stopped at one of my favorite burger places, Heartland Brewery. I got a cheeseburger and Hayley got their turkey burger-both were deliciousness, as always! location, since it was where we were, and it was...well...kind of weird, There's a front area with a chalkboard menu, lots of merch, a display case, and little baskets full of pre-wrapped cookies. We wanted to try a couple of the pies and ice cream, but were too full so we just got 3 cookies to share. We grabbed the cookies from the basket and checked out at the counter. Then we went to this strange hotel lobby/lounge area for milkbar customers...yeah...strange right? I really had hoped for a more...actual restaurant...and for fresh cookies. I'm not sure if all the locations are like this or just midtown. The compost cookie was good, I could definitely detect some coffee grounds in there. The peanut butter cookie was also pretty tasty, but incredibly rich-possibly even too rich for me. The cornflake chocolate chip marshmallow cookie is far and away the best cookie at milk bar. It was very good-however, I almost liked when I made it better. All the cookies were good but, not out of this world: I attribute part of this to the fact that I generally prefer cookies warm and fresh. If anyone has experience with the other locations, I'd love to know if they're better? Now these are cookies. I already knew about the wonder that is Levain, and Hayley was eager to learn for herself. THESE, my friends, do not disappoint. Huge, biscuit like cookies give way to perfect, slightly undercooked, warm and gooey cookie insides! *sigh* sweet bliss. We each got the Chocolate Chip Walnut cookies, because they're my favorite and Hayley's not a big fan of too much chocolate or oatmeal raisin cookies. These cookies are always worth going out of the way to the upper west side. 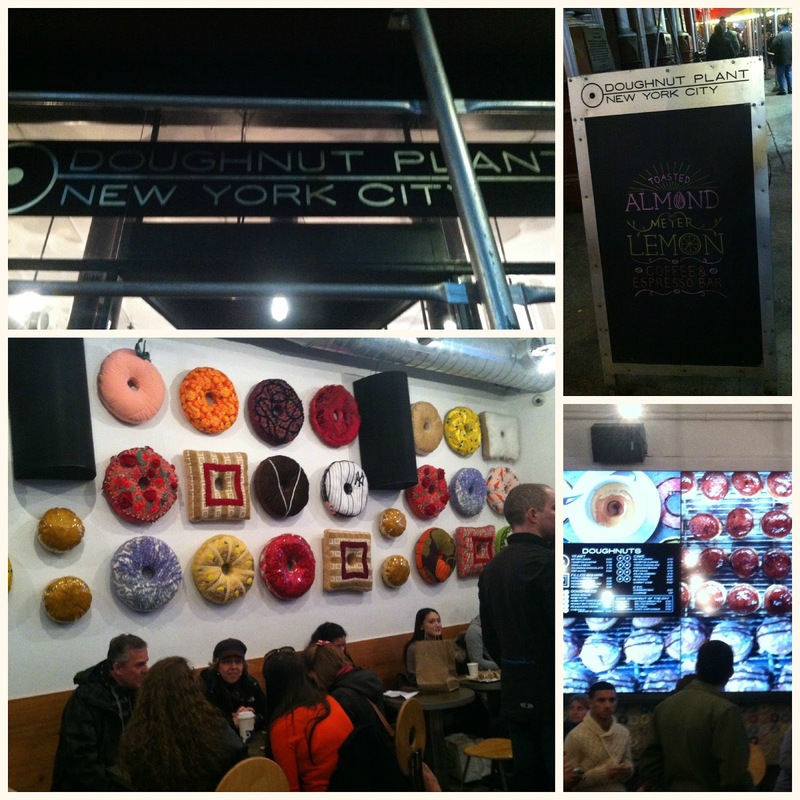 This was my first time at the UWS location (as opposed to Harlem) and we were met with a massive line. Totally worth it, but I suggest trying the Harlem bakery if you want to avoid lines and crowds. Next we hopped a subway down to Chelsea to go check out Eataly (which of course...I forgot to take photos of), and on the way we encountered the Doughnut Plant-which was on the agenda for Monday (I first heard about it on TV and Hayley loves doughnuts so she really wanted to try). Since we were already there, though, we walked in and ordered some sweets for breakfast the next day. They have the most amazing and unique flavors, and there were so many we wanted to try! Unfortunately, we could only get what they had there in their display case (psh, lame :P). Hayley got their cinnamon roll and a Meyer Lemon doughnut. 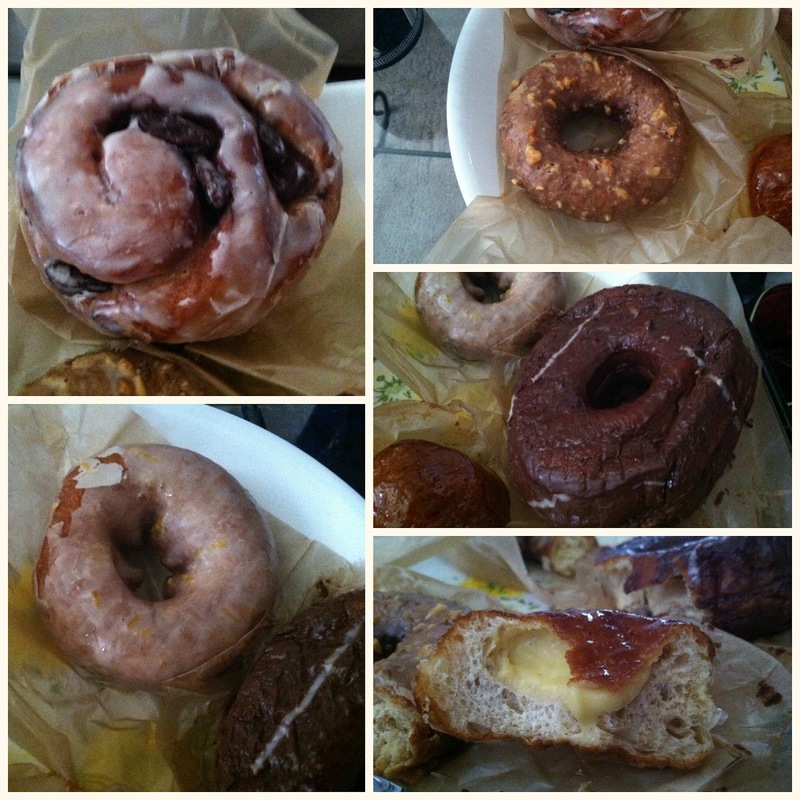 I got their salted peanut, Valrhona chocolate, and creme brulee doughnuts (we shared, and Michael had some too). They were good. I liked the Valrhona chocolate a lot because I felt the darkness of the chocolate helped balance the sweeteness that I usually get overwhelmed by with doughnuts. I also really loved the creme brulee-they even had a caramelized sugar top! While we liked our doughnuts, we both agreed: not the best ever. 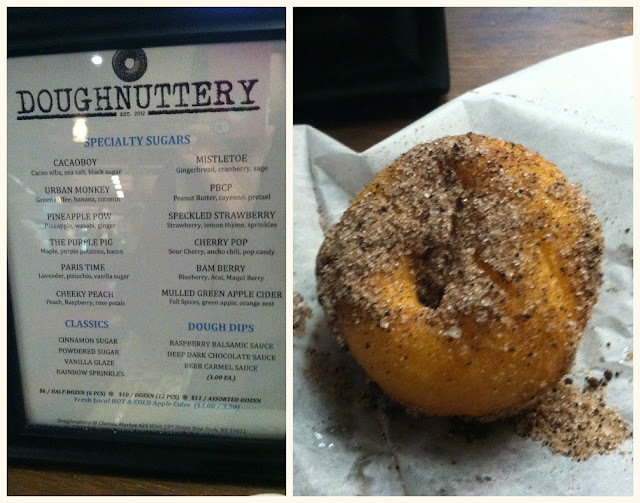 Good doughnuts, extremely interesting flavors, but when it comes down to it: no better than any other doughnut. We began Sunday by taking in The Met. I hadn't been since my first couple months living in NYC, so it was almost as new to me as it was to Hayley! We loved it, oohing and ahing over the statues and history and art! I was so excited to see a bunch of Monet paintings (my favorite artist) and Hayley saw a bunch by some of her faves as well! After the museum, we were starving. So we walked around the upper east side, in search of pizza. Luckily for us, we only needed to walk a few blocks before we stumbled upon Serafina's. We walked up the stairs into the lovely, bustling, very busy Italian restaurant and were seated immediately. I suggested splitting a pizza, but Hayley seemed certain we could each finish an entire pizza by ourselves. I got the Margherita pizza, which was heavely with a perfectly crisp thin crust and the perfect amount of delicious sauce, cheese, and basil. Hayley got the 4 Stagioni (which had tomato, mozzarella, mushrooms, artichokes, Italian olives & prosciutto )-she loved hers too, and we devoured our pizzas in record time, joking with our waiter that we obviously hated it. In true upper east side fashion, we were surrounded by snooty rich people. This is Hayley imitating them. Hayley has a problem. She's an addict. A wafels & dinges addict. And it's all my fault. It all started out innocently enough. We walked through Central park and ended up at the cart on 60th and 5th. I told her how amazing these were, how they were unlike any other waffle she'd ever had, and how they were life changing. But I just didn't know how true it really would be. I ordered my favorite, the liege wafel with Nutella, and Hayley tried "The Throwdown"-a liege wafel with speculoos (mm!) and whipped cream. And we foodgasmed. And Hayley declared it the best thing she'd eaten for the entire trip. And she went back, and got a second wafel-with just powdered sugar (it was actually pretty amazing plain). They're perfectly crisp yet tender and sugary but not too sweet. Ahhhh wafels and dinges. And it's all she could talk about the rest of the trip. This picture above was taken the next day, Monday. Where we each got another wafel. We intended to go one last time before Hayley flew home on Tuesday, but it was raining and the cart was closed. She's currently extremely upset that she is across the country and won't be having any for awhile. Hayley is such a colorful and sweet person I obviously had to take her to Dylan's Candy Bar! 3 floors full of bright colors and sweets galore! It was super fun and she found some great treats to give to her family, and her pooch back home. There were even some creative macarons (courtesy of Dana's Bakery) at the cafe, and Hayley got the fruity cereal and toasted coconut flavors to try out (I wanted to try their cookie dough macaron but they were out *sigh*). So I pretty much tell anyone who will listen how much I love Max Brenner's-particularly their Italian Thick Hot Chocolate. Hayley trusted my sage advice, and we got dinner there (after some Union Square shopping). We shared their amazing Really Cheesy-Really Crunch Mac & Cheese with a side of waffle fries. All amazing deliciousness, as per usual. And then we each got our own mug of Italian Thick Hot Chocolate (made with milk chocolate), and agreed that all other hot chocolates are inferior and that we worry we can never have any other hot chocolates, because it would just be like...a waste. Because it wouldn't be the best. Rich...creamy...like a liquid candy bar. Love. Katz's deli was one of the few places Hayley said we NEEDED to go. She works in a sandwich/cheese shop and loves sandwiches and all the like. 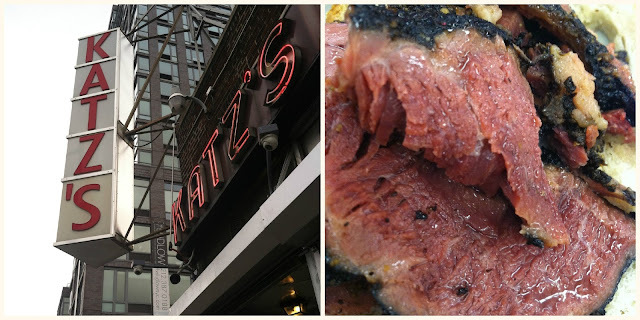 And Katz's is famous for their hot pastrami sandwiches. I didn't actually order anything except for some fries, as I'm not a big sandwich/lunch meat person. But when Hayley let me try some of her pastrami off the sandwich I...just...could not believe it. I don't even like pastrami. But this was a whole other level. The pastrami practically melted in your mouth and had the most amazing flavor. She ended up ordering a second sandwich, and I picked some of the pastrami off that one too. Hayley is a good friend. She then even bought a salami to take home to her dad (who had visited Katz the last time he had come to NYC and raved to her about it). Good recommendation Hayley's dad....smart guy. Chelsea's market is foodie paradise, so obviously I had to take Hayley around. We almost bought like a million things. I'm still totally in love with this white truffle salt from one of the stores. Someday that salt will be mine. After Chelsea Market we went back down to lower manhattan, not too far from Katz's deli, to have dinner at Jane's restaurant (I had been there with Michael for our Valentine's Day). Ever since I'd heard about the toasted ricotta gnocchi with a white truffle cream sauce (and that it had been featured on "The Best Thing I Ever Ate") I had been dying to try it! So I ordered that, and a side of rosemary fries. Hayley ordered the butternut squash risotto. Everything was divine! 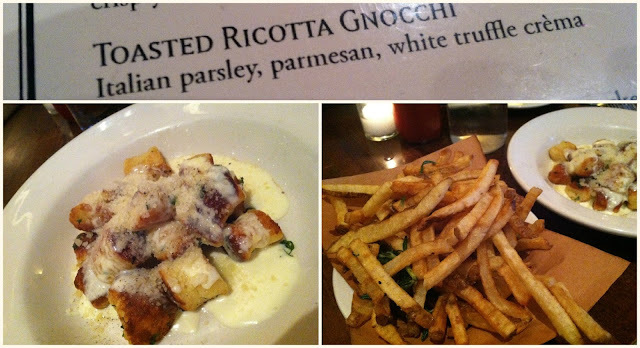 The truffle flavor & richness of the gnocchi did get overwhelming about halfway through, but I just took the rest of the pasta home for later (and omg the fries dipped in the sauce was to die for). Hayley loved her risotto and I tried it and liked it as well. Yumminess. Rainy Tuesday morning saw a sad Hayley and Kayle. She had to fly home. And we couldn't have wafels & dinges. 2 very sad things. So, since we were bummed and had some time to kill, we walked back to Martha's to end the trip the way it began. I saw a pie in the case that was new to me, so I tried their marshmallow cream pie-which was good, a little too sweet though, I probably wouldn't order it again (because there are like a million other things I love there). Hayley tried their Nutella hot chocolate (omg yum) with some cinnamon sprinkled on top along with some banana walnut pound cake-she loved everything. I had some of the best food I've ever eaten over this past weekend, and had some of the most fun with one of my most favorite people :). 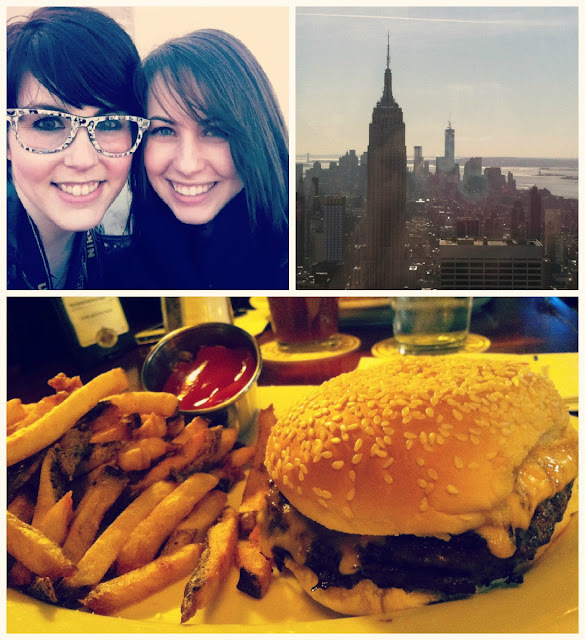 I am so happy Hayley visited and now I just have to convince her to come back to NYC soon!